Microsoft had a ton of games to show off at its E3 conference, but the biggest news is that the company is introducing two new models of the Xbox One. 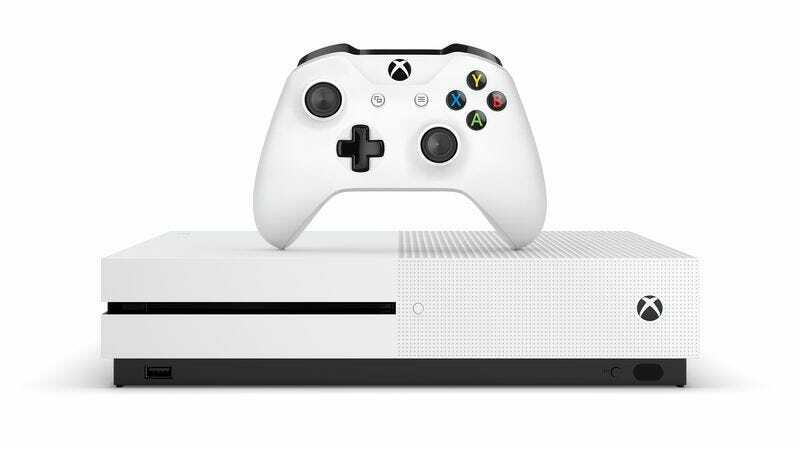 Confirming the rumors that have been swirling for months, a slimmer version of the console, called the Xbox One S, will be hitting shelves starting in August with a $400 limited edition that includes a 2 TB hard dive. Later in the year it’ll come in 1 TB and 500 GB flavors for $350 and $300, respectively. Given the immensity of that original box—you might remember A.V. Club editor-in-chief John Teti describing it as “a hulking golem”—this is a welcome revision, and Microsoft is taking the opportunity to add some extra bells and whistles, like 4K Blu-ray support and a built-in power supply so you don’t have to find space for one of those giant bricks that hangs off your system. The second new Xbox One won’t be launching until the end of 2017, but it’s already made your existing Xbox One—or the Xbox One S you might have considered purchasing—completely obsolete. As Xbox head Phil Spencer hinted earlier this year, Microsoft is looking to break from the traditional cycle of console generations by releasing a significantly more powerful version of the Xbox One without moving on to a distinct new console. (Like say, the Xbox Two.) Instead, every game and accessory that’s released will be compatible with all three Xbox Ones. This new super Xbox One, which Microsoft is calling Project Scorpio for now, wasn’t shown, but we did get to see a swell video that included a bunch of game developers describing the upgraded system’s benefits, including the ability to produce “the highest quality pixels that anybody has seen.” Who knew pixels could get any better? This comes just days, after the CEO of Sony Interactive Entertainment acknowledged that an upgraded PlayStation 4 is in the works. Like Microsoft’s Scorpio, Sony intends to sell the two PlayStation 4s side-by-side and make sure every game runs on both. If you’d rather not shell out $400 or more every couple of years for a new console, you could try your luck with a fancy super-powered gaming computer. If that’s the case, Microsoft still has you covered, as it’s now dedicated to bringing many of its biggest games, like Gears Of War 4 and Scalebound, to Windows 10 in addition to Xbox One. Branded as “Play Anywhere” games, anyone who buys a digital versions of these releases will get both a PC and Xbox One copy and be able to share their save games between platforms.